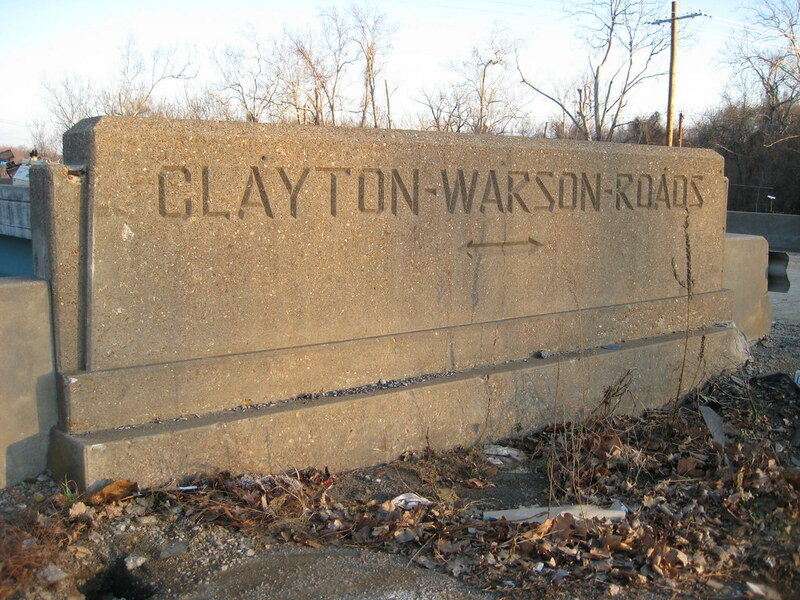 For this post we venture beyond the City limit to the nearby inner suburbs of Ladue and the western portion of Richmond Heights to view not the loss of a historic building in an urban context, but that of fragments of an aging transportation infrastructure undergoing total replacement. The portion of Highway 40 between Brentwood Boulevard and Spoede Road dates from 1936 to 1946. 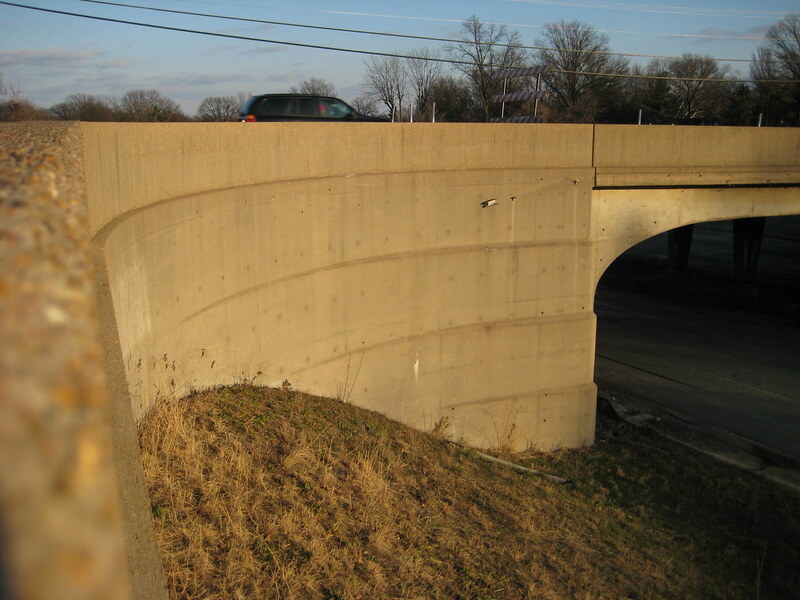 While it was no Merritt Parkway, many of the bridges constructed along this stretch of highway reflect the streamlined style that was applied to almost anything having to do with movement. The photo above is from a series of old photos available for view on thenewi64.org history page. This section of roadway was a relic from another era, when cars traveled at a then considered speedy 45-50 mph. It was built with an almost parkway like feel, with two lanes each direction separated by a grassy median. This parkway like feel was, and still is to this day augmented by the fact that it bisects a community that by choice has preserved an almost rural feel by shunning office parks, mega-strip malls, and cookie cutter subdivisions that fill much of the modern suburban landscape. 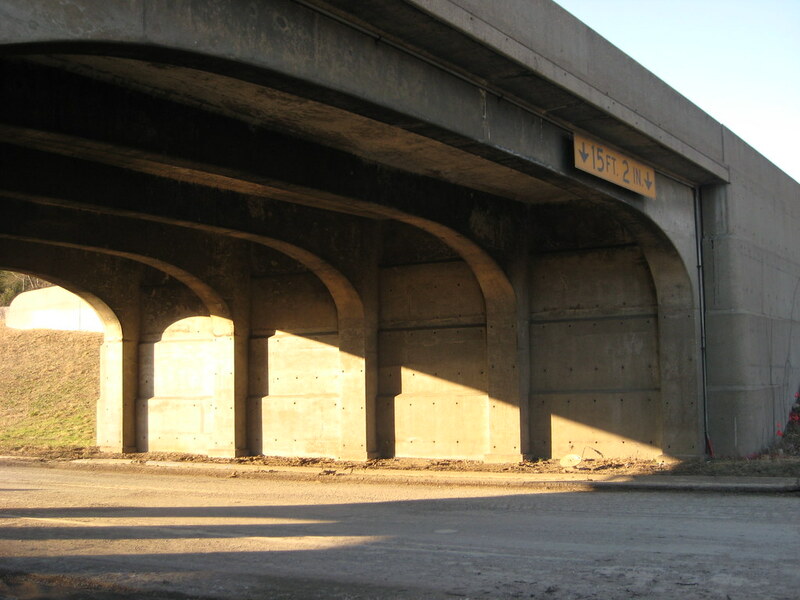 Without a doubt the most interesting surviving structures were the overpasses at McKnight and McCutcheon. 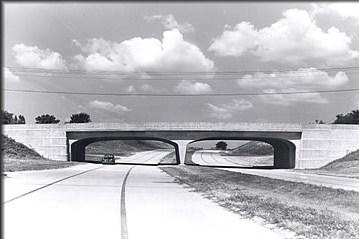 The McKnight bridge was a wonderful expression of streamlined modern with its curving stepped embankments. 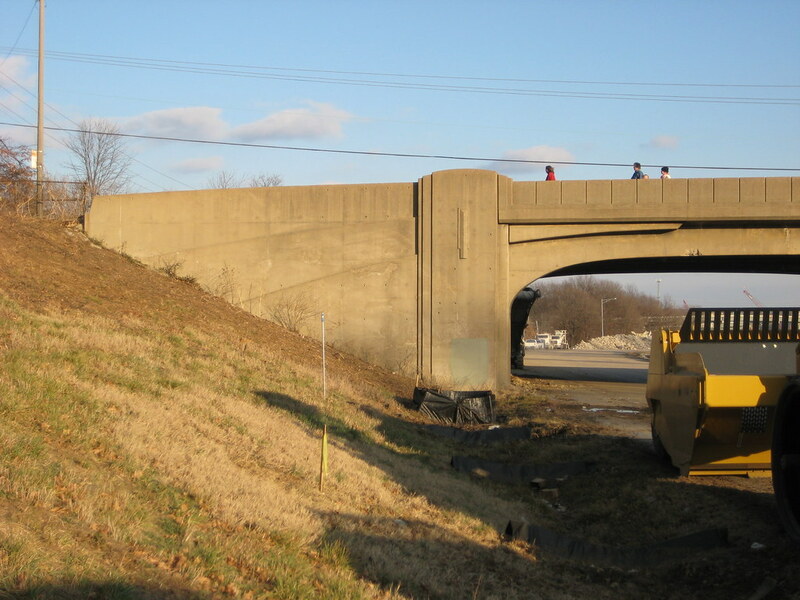 The bridge at McCutcheon was a bit more fanciful with the lines of its embankments fanning out from the earth. 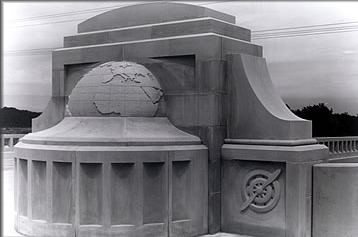 There are more art deco influences in this bridge with its decorative pilasters flanking the span and a medallion at the graceful center columns. Photographing the bridges was an almost surreal experience. For the first time in my life, I was walking down the middle of the highway! The bridges that I had known and appreciated since I was a child growing up nearby could now be fully enjoyed at a pace a bit slower than 70 mph. 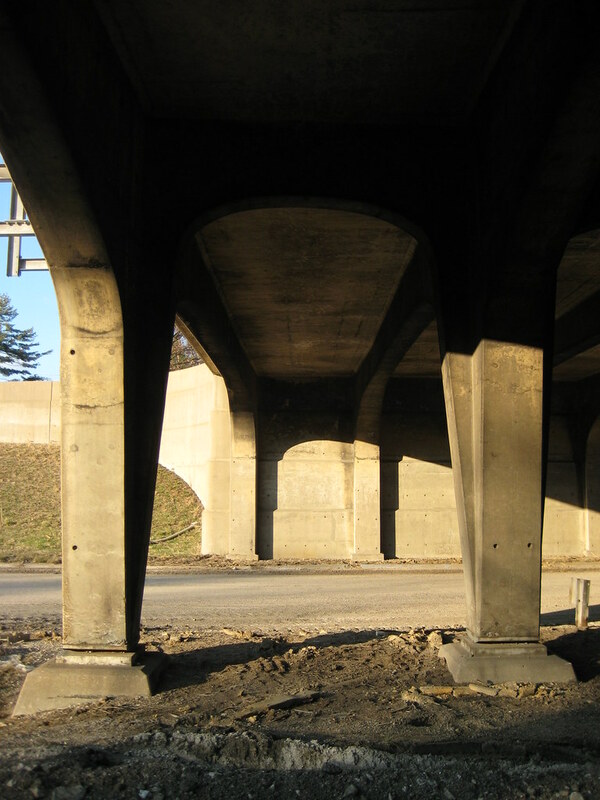 Details that I had never been able to see but for a nano second such as the gracefulness of the arches running perpendicular between the center columns or the way the lines of the embankments at McKnight continued through under the spans could now be captured. I was not alone in my fascination. On a sunny but very chilly Sunday in mid-January there were several people out. Some like me were taking photographs, while others were simply out running or walking the dog. 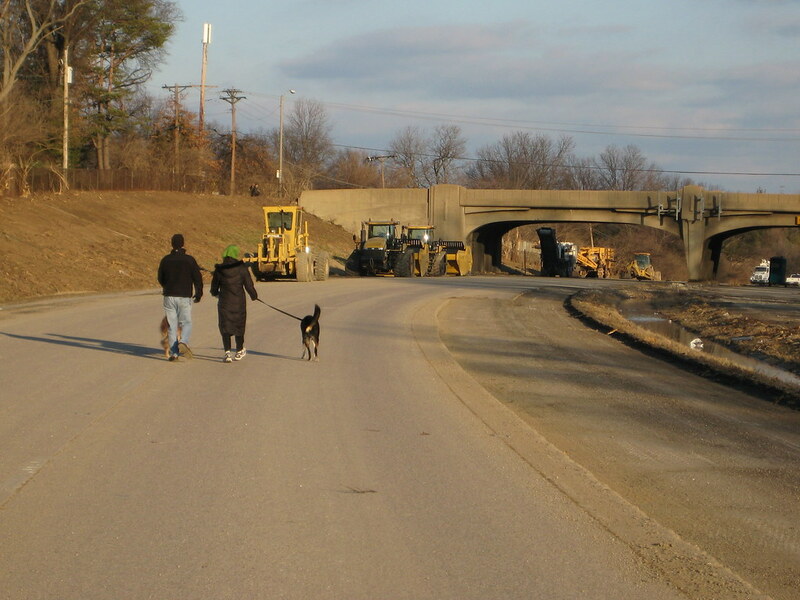 It was as if people had taken over the former highway as a a new recreation area or a linear park. The temporary loss of a highway that played a major role in the decentralization of the City of St. Louis is certainly nothing to mourn, in fact my prediction that the ridiculously over hyped closure would be a non-event instead of the predicted doomsday have come to fruition. The fact that people have easily adjusted, and a large percentage have switched to nearby surface roads as opposed to heading to 70 or 44 leads me to believe that Steve Patterson's concept of replacing 40 with a boulevard including mass transit instead of an over-engineered high speed freeway might have actually been feasible. 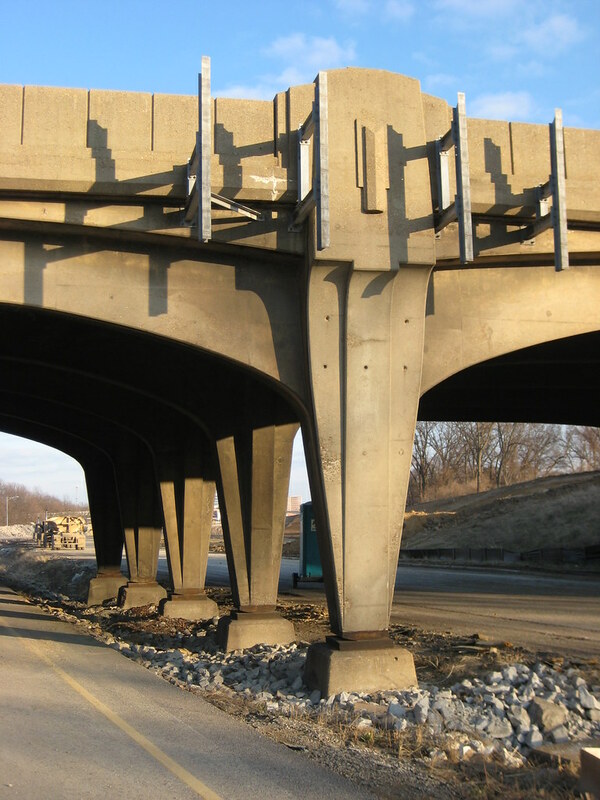 What is worth mourning is the loss of structures designed with a human hand from an era when good design was a standard feature of public infrastructure. The replacement bridges will be basic utilitarian structures. 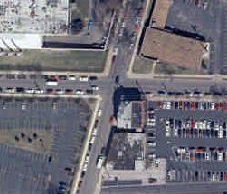 Today MoDot's idea of "good design" is some black iron fencing and some cutsie neo-historic lamp posts (click here to see a really lame rendering from their web site). More photos can be seen here on Flickr. Today I stumbled upon this article in the Chicago Tribune about a new virtual reality exhibit at the Museum of Science & Industry featuring the World's Columbian Exposition of 1893 which has come to commonly be known as the "White City" due to its massive classically styled buildings executed in white plaster (that ultimately led to the style of the 1904 Worlds Fair that we here in the Lou so love to worship). The virtual reality presentation was created by Lisa Snyder of UCLA's urban simulation team using photographs, plans and maps of the exposition. One sentence in the article jumped out at me, and that is: "the technology normally is used to record buildings, streets and infrastructure as they exist now, giving planners a way to visualize tearing down or restructuring the areas". I thought to myself - wow wouldn't it be nice next time someone proposes to demolish the next landmark building to have this technology at arms reach to present to the powers that be what an awful idea it is to allow this to occur? I would think that in many cases this could be a very powerful tool. You can check out some of the virtual reality of the Chicago exhibit here. 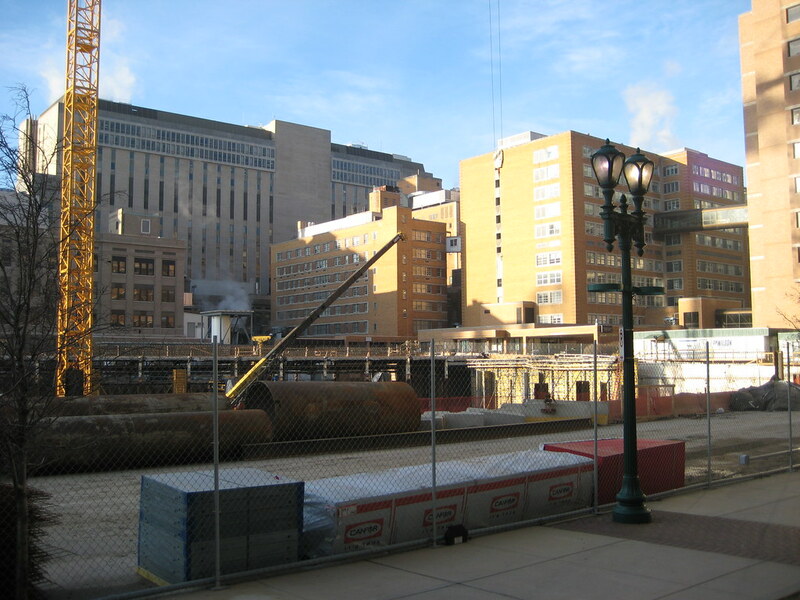 As I mentioned in the last post, the Washington University Medical Center has introduced an master plan for the next ten years that calls for over a dozen demolitions. 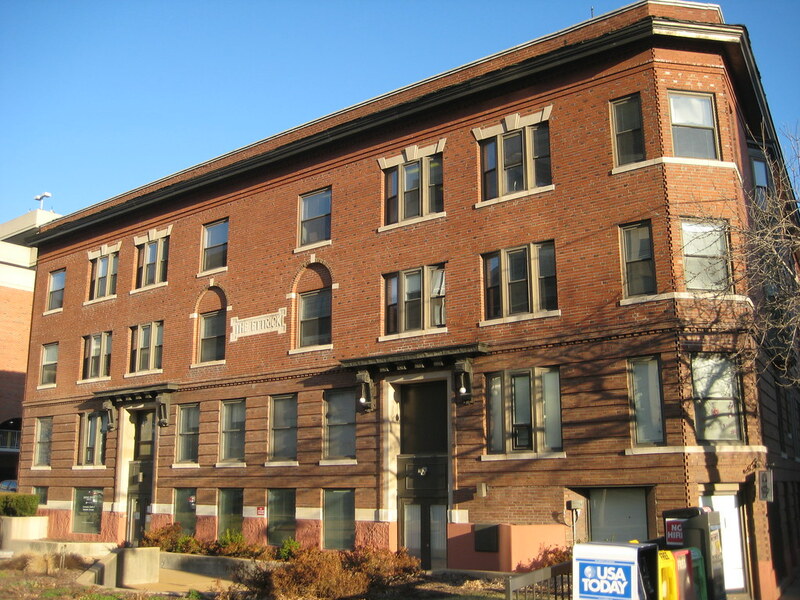 Below are some photos of some of the buildings marked for removal as well as explanations given in Board Bill 443. Just north of the Barnes south tower is a cluster of fairly benign buildings that will be removed for "replacement bed spaces", diagnostic, and support areas. Replacement beds?... Hmmm, what are they replacing? 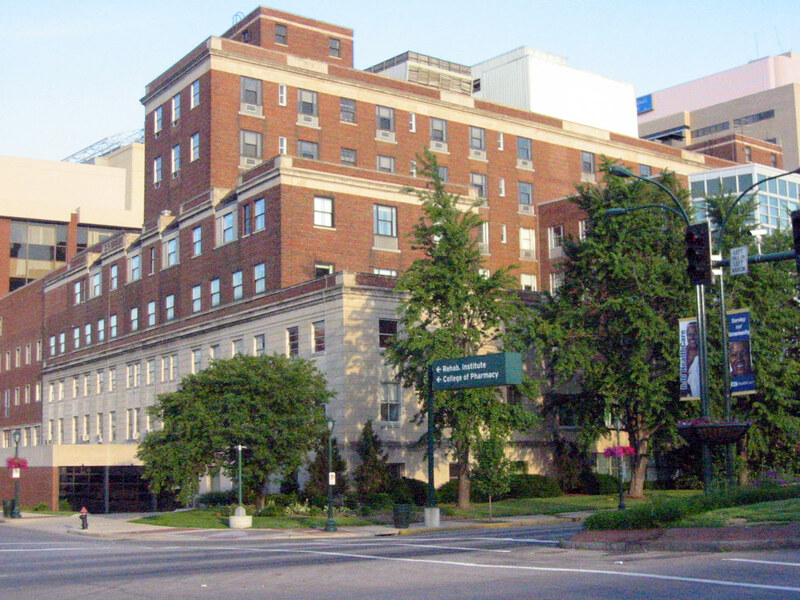 According to the plan, the Jewish Hospital Building at Kingshighway & Forest Park will be demolished near the end of the 10 year period. 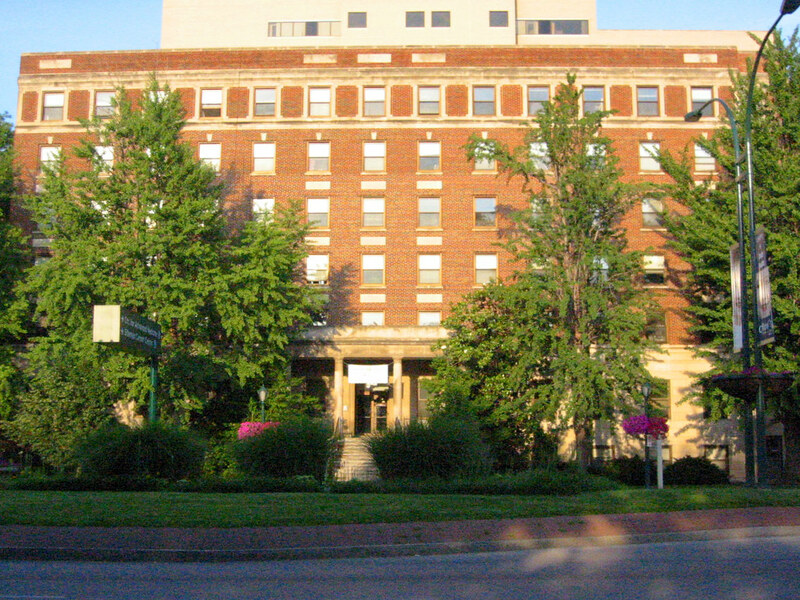 Nothing is listed in the plan to replace this building. So are we to expect an empty green space at this prime corner? 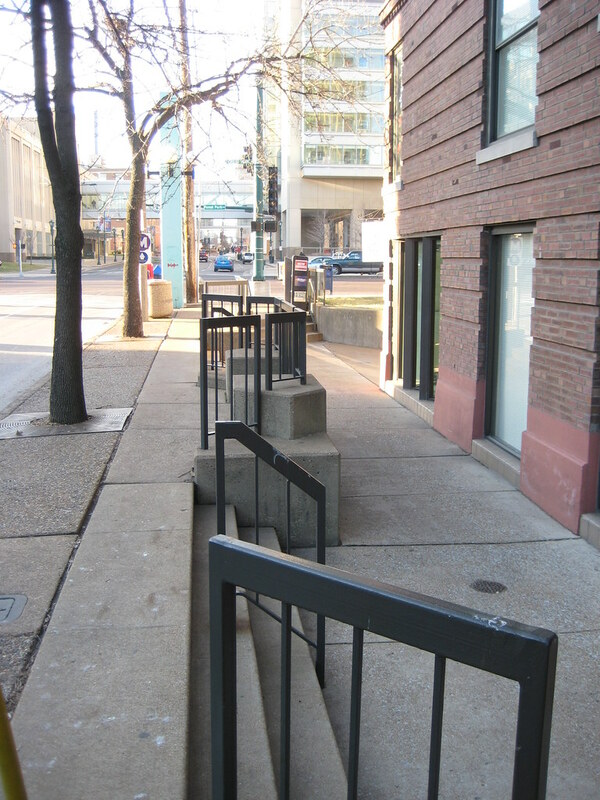 Such a solution is viewed by SLU as an excellent use of a corner in several locations. Maybe BJC is taking some pointers from father Biondi? 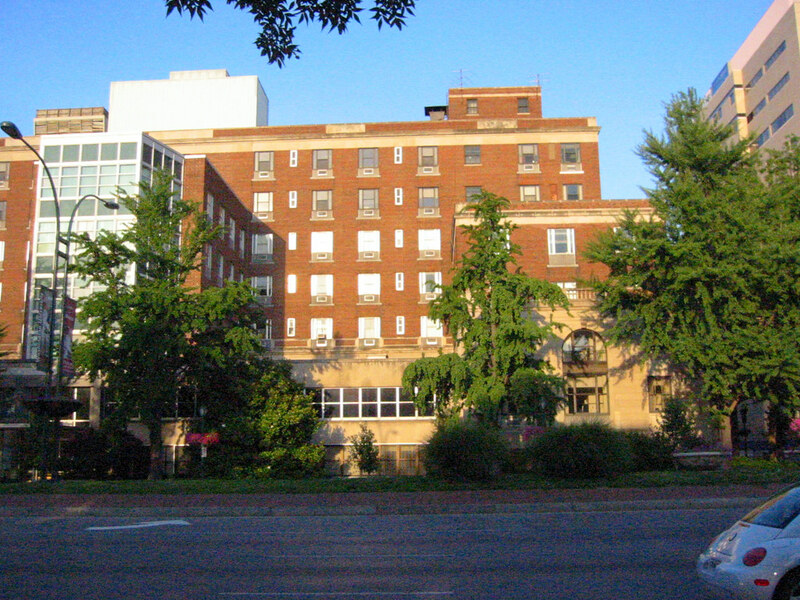 South of the Jewish Hospital Building, across Parkview Place, the Shoenberg School of Nursing Building is shown to be demolished on the attachment map, but is not specifically mentioned in the text. I would guess that this could be to make way for future expansion of Children's Hospital, which surrounds the building to the east and south. On Forest Park, just east of St. Nicholas Greek Orthodox Church, what is now called the Shoenberg Research Building is shown to be demolished for an expansion of the large North Garage just to the east. 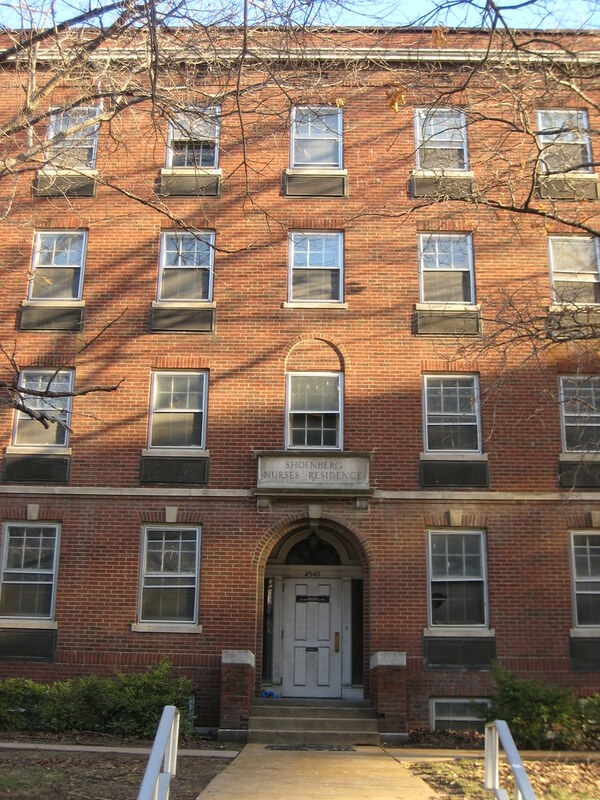 The buildings original use is inscribed in stone "Shoenberg Nurses Residence" over the entrance. At the corner of Forest Park and Euclid the Ettrick Building is also shown to be demolished. Besides the CID and Shriners Buildings listed as possible demolitions, this building is probably the most archticturally significant building scheduled for removal in the plan. The plan states that the Ettrick is to be replaced with a new building to house expanded resident clinic facilities, of approximately 200,000 square feet and structured for vertical expansion. I will admit that I have mixed opinions about this one. On one side, there is the the fact that the Ettrick is a very attractive building and reflects the scale and feel of the Central West End. On the flip side, there is the awkwardness of its floor levels. Built as an apartment building with its basement raised halfway out of the ground, retail spaces we later added at this lower level and creating an awkward moat to access the spaces. The low headroom in these basement spaces and the moat and stairs taking the majority of the sidewalk space is a bit of a clusterf***. The urbanist in me really likes the idea of a new larger building with attractive functional retail spaces and a real streetscape along Euclid. East of Taylor, the plan shows that the various institutions of the Med Center have been on a buying binge over the last decade, purchasing of over a dozen properties. Each property is listed with an address, building name, and acreage. The fact that acreage is specified show that they consider the purchases mainly for the potential of new development on vacant land, even if there is a building present. 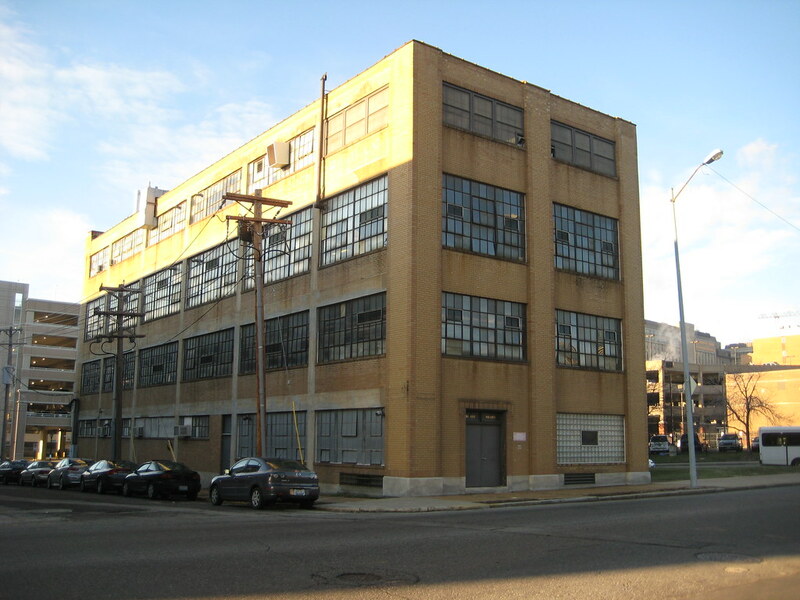 This unadorned building at 4500 Parkview Place is listed as potentially being re-skinned and expanded... or demolished. 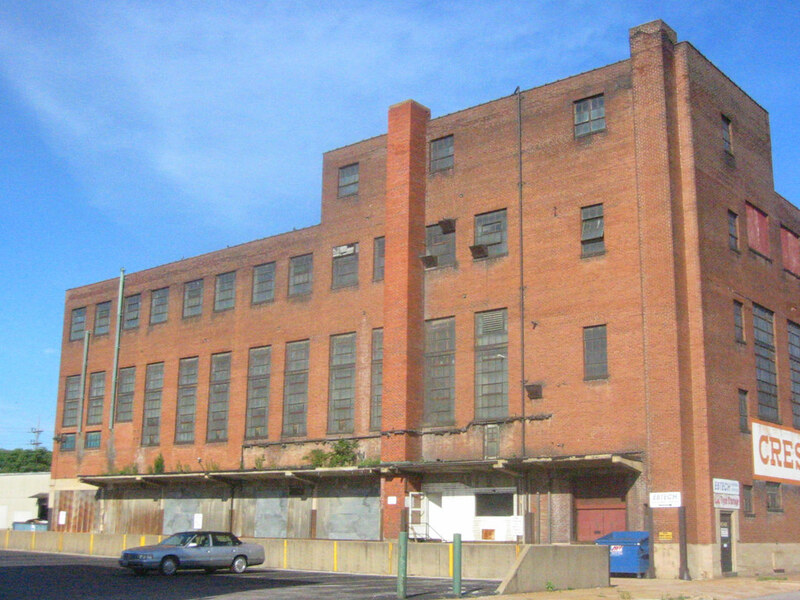 Further east at 4340 Duncan Avenue, the former Crescent Electric Building is planned to be demolished to create a development pad for the Cortex area. The idea this large flexible industrial building could be adapted for re-use (as it has been before) seems to be beyond the cognitive mentality of planners for the area. For more information about this building, see this post from Ecology of Absence. 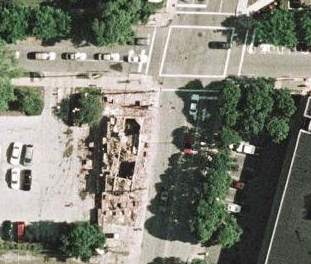 In 2006, Magee's bar at Taylor and Clayton Avenues was purchased and demolished (Google caught the scene in mid-demolition) with seemingly no plan for re-use of the property. Apparently bars are not seen as conducive neighbors by the WUMC. You can see a few shots of Magee's that I found by fellow Flickrites here, and a nice detail shot showing the cast iron and a classic striped awning here. One block east, another great corner building, the last gasp of urbanism at the intersection of Newstead and Clayton was purchased in 2004 and demolished. Anyone out there have a photo of this one? 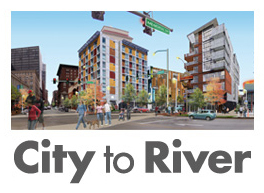 One positive item gleaned from the plan is a statement in the last paragraph of text describing the plan: "The Washington University Medical Center anticipates future development of properties fronting Forest Park Parkway and/or located north of Forest Park Parkway to incorporate retail and mixed uses, so as to further integrate these properties into the urban environment of the Central West End."